For those who didn't catch it live, on-demand video of this morning's presser in Scranton is already making the rounds. 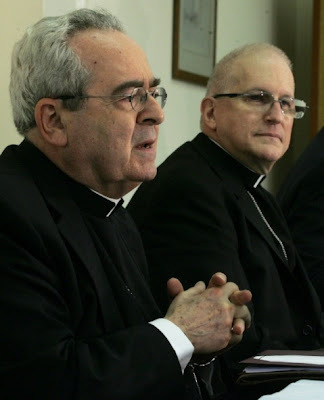 To brief: reading from a prepared statement, Bishop Joseph Martino admitted to the assembled media that "there has not been a clear consensus regarding [his] pastoral initiatives or way of governance" of the 350,000-member diocese following parish and school closings which, however necessary due to changing demographics, caused considerable controversy in the 11-county church. The 63 year-old prelate said that the difficulties led to bouts of insomnia and a weakened immune system which, having taken a toll on his physical vigor, led him to submit his resignation to Pope Benedict in June, nearly a year after he first mentioned to his metropolitan that "moving on" might be the best plan for himself and the diocese. That said, Martino added that he "clearly" wasn't "prostrate with illness" and, freed from the burdens of office, was "feel[ing] fine" at the hourlong session. To handle the bulk of the diocese's affairs, the freshly-named apostolic administrator, Cardinal Justin Rigali, tapped Msgr Joseph Bambera, a well-regarded local pastor, as his delegate. A former chair of the diocese's Presbyteral Council and member of the Board of Trustees of the Jesuit-run University of Scranton, Bambera notably comes to the post from outside the current diocesan curia. While the temporary caretaker of the Scranton church reappointed the bulk of Martino's eight vicars to continue in their current capacities on an interim basis, one of two figures to not make the cut was Msgr Kevin McMahon -- the highly-regarded moral theologian Martino recently recruited as his episcopal vicar for "Catholic Doctrine, Identity and Mission." Before the Scranton post was created for him last month, the priest of Wilmington served in St Louis as resident counsel on bioethics and health care issues to another prominent "lightning rod" prelate: Archbishop Raymond Burke, who was transferred to Rome last year as the global church's "chief justice." Though his already tight schedule will keep his presence in Scranton limited, Rigali said he planned to return for an Italian festival in the city next weekend, and that his "hope" was to have a new bishop in place within six months. And what the great kingmaker hopes for, you can pretty much take to the bank. For all the rest, just watch the tape.